Walt Disney created some of the most popular characters of all time. Here are some of the products available through Amazon.com or their partners. If you wish to purchase any of these items, click on either the title or the picture to be directed to Amazon.com. By Jo-Ann Fabrics & Crafts Nobody can resist the fun of Disney albums - showcasing Mickey & Minnie Mouse, Goofy, Donald Duck and Pluto. This postbound album features a recessed window with a die-cut character images. Holds true 12''x12'' paper. By Jo-Ann Fabrics & Crafts Customize this album to fit the personality of your little princess. Coordinating princess stickers - Ariel, Jasmine, Belle, Cinderella, Snow White & Sleeping Beauty and ABC stickers allow you to choose what goes on the cover of this album. This post bound album has a vinyl cover with a unique design. By EK Success A Cinderella album for your little princess! 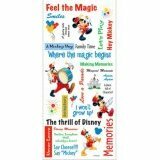 With a beautiful glitter-embossed design on the cover, remember your Disney trip or just memories from your little girl. Great as a Disney autograph book. Also in 12"x12" and 8" x 8". By Sandylion This post bound album features a recessed window with die-cut princess images. This pink album is great for the little princesses in your life. Light Pink with ribbon and Belle, Cinderella and Sleeping Beauty. Holds true 12" x 12" papers, and comes with 10 top loading page protectors and 10 white paper sheets. The finished album size is 13 1/4" x 12 1/4." Album comes in a matching keepsake box that is perfect for gift giving or to protect those memories. Post position in standard location (8-1/2" apart). Uses refills SCBPR02. For more ideas on how to preserve your memories, go to the Disney Photo Albums, Scrapbooks, & Memory Books Page. By EK Success Nobody can resist the fun of Disney albums - showcasing Tinkerbell. This postbound album features a recessed window with a die-cut character images. Holds true 12''x12'' paper. By Jo-Ann Fabrics & Crafts Here are a few of your favorite Disney friends - Pooh, Tigger, Piglet & Eeyore. This fabulous album is great for preserving your memories! By Jo-Ann Fabrics & Crafts This classic 12"x12" album now features Sandylions Vintage Disney design. Coordinates well with Vintage Disney stickers. By EK Success This gorgeous postbound album is a must have for any Mickey Mouse fans. With a classic black cover, Mickey's face is embossed in a shiny black coating to make this album ideal for Disney vacations or just because you like Mickey. 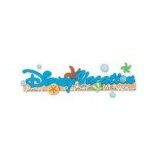 By EK Success EK Success has created another amazing Disney album. With great shades of blues, purples and pinks, this album is perfect for preserving memories from a theme park or just as an everyday scrapbook. 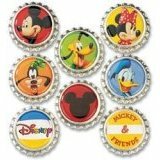 By Jo-Ann Disney Embroidered Stickers are each beautifully colored and accented to help you create treasured memories. Each sheet has one special caption or title, and then is filled with a variety of coordinating accents that will bring your project together. These stickers are perfect for scrapbook pages, memory books, photo albums, altered books, cards and more. By Jo-Ann These themed stickers are perfect for many different types of scrapbook pages. 5 1/2 x 12 inches, they are easy to use and acid free and lignin free of course. They are a wonderful addition to your scrapbooking sticker collection. By Jo-Ann Decorative blank cards that are perfect for journaling on scrapbook pages, gift tags and place cards. By Jo-Ann What Mickey Mouse page is complete with out the details of these adorable photo corners. Simply slip them over 1, 2, 3 or all four of the corners of a page or photo to add that special touch to your page. Also perfect to use if you do not want to use adhesive on your photographs. By Jo-Ann Ribbon Slides coordinate with Ribbons and Adhesive Labels or use strips of Disney paper to weave through the openings. By Jo-Ann What Princess page is complete with out the details of these adorable photo corners. Simply slip them over 1, 2, 3 or all four of the corners of a page to add that special touch to your page. Also perfect to use if you do not want to use adhesive on your photographs. By Jo-Ann These Princess Ribbons & Adhesive Labels coordinate very well with other Disney embellishments. Use them seperately or together for a magical design. By EK Success Fun and functional embellishments for holding things together, unique page accents, gift tags or present toppers. By Jo-Ann Fabrics & Crafts Create wonderful scrapbook and memory book pages with this 2'' Super Jumbo Mickey Mouse Craft Punch. By Jo-Ann Fabrics & Crafts Create wonderful scrapbook and memory book pages with this small Mickey Mouse Craft Punch. By Hot Off The Press Simply patterned papers featuring the classic Mickey and Minnie silhouettes are a perfect way to add a touch of the Disney magic to any album page! From traditional red and black color combinations to updated pastels, there is a paper for any occasion. 12 sheets total; sample layouts share ideas too. Pull-out papers measure 8.5''x11''. Acid- and lignin-free. By Jo-Ann Create wonderful scrapbook and memory book pages with this 2'' Super Jumbo Pooh Face Craft Punch. By Jo-Ann From castles and roller coasters to cartoon characters this collection will capture and preserve Magical Memories for years to come. By Jo-Ann These Mickey Ribbons & Adhesive Labels coordinate very well with other Disney embellishments. Use them seperately or together for a magical design. By Jo-Ann These Disney Princess Ribbons & Adhesive Labels coordinate very well with other Disney embellishments. Use them seperately or together for a magical design. By EK Success Add a trendy accent with EK Bottle Caps. They are a fun embellishment that looks like the real thing. Each cap is the original size of bottle caps, has a colorful picture on the top of the cap and has an adhesive backing so they are quick and easy to use. Disney Princess- 8 caps that include Ariel, Aurora, Belle, Snow White, Jasmine, Cinderella and more.